Books to Give, Not Lend: Gifts that unleash a kid’s unruly imagination. I’m a librarian, so naturally I encourage people to use their public and school libraries. Some books, however, are meant to be purchased rather than borrowed, and what better time than the holiday gift-giving season to take a closer look at those. Books can be containers of imaginary worlds, inviting us in for a closer look. For children, this is where the magic begins. And when viewing works by artist and illustrator Robert Sabuda, the magic is enthralling. 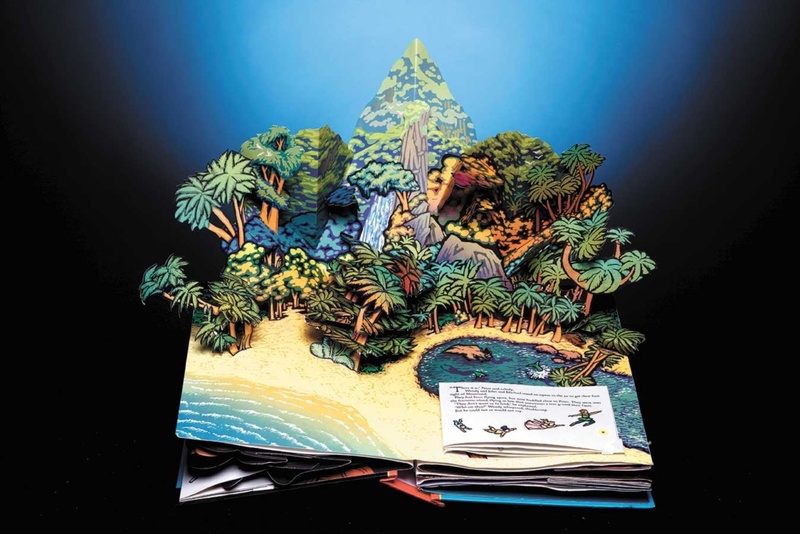 Sabuda’s America the Beautiful is a pop-up book with three-dimensional images depicting the scenes described in the iconic song of the same name. Featuring intricate detailed images of the Golden Gate Bridge, Mount Rushmore, a steamboat, the Capitol Building and the New York City skyline, this book has all the verses to the song, with images to match the first, most well-known verse. White images and clean lines may appeal a little more to the budding engineer than to the budding artist, but both will be impressed. Sabuda’s Peter Pan, on the other hand, is as lavish as America the Beautiful is spare. An abridged retelling of the tale by J.M. 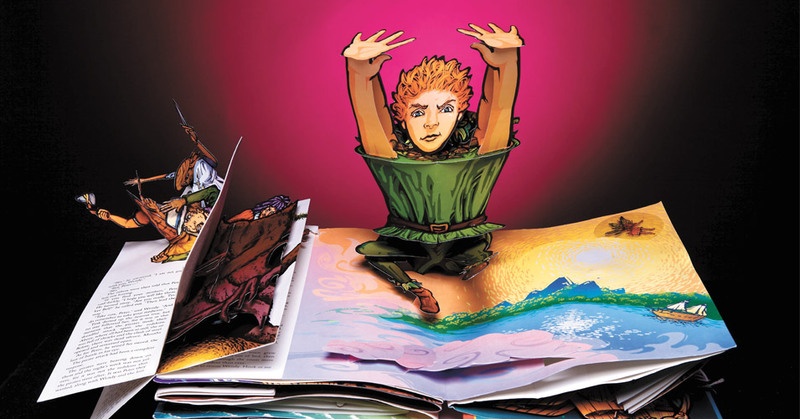 Barrie, Sabuda’s Peter Pan brings to life a pop-up version of Neverland that is sure to amaze and impress young readers. Full-color, detailed illustrations of Pan, Captain Hook’s pirate ship, and their lushly imagined environs unfold with each turn of the page. Meanwhile, the story is retold in the form of mini-booklets that appear tucked in alongside the primary pop-up elements. These mini-booklets themselves contain additional pop-up images, making this one of the most spectacular books of its kind. Pop-ups aren’t limited to the imaginary world, however. Non-fiction selections abound, such as these two books focusing on nature but targeting different age groups. Welcome to the Neighborwood by Shawn Sheehy educates children ages 4 to 7 about the nests and homes built by such diverse creatures as snails, spiders and beavers. Images on the page blend seamlessly with pop-up recreations of a honeycomb, a wasp’s nest and a beaver lodge. The three-dimensional parts are detailed without seeming fragile, so younger hands can manage the book without accidentally damaging it. For older naturalists, and those who are not easily “creeped out,” Bugs, written by George McGavin and illustrated by Jim Kay, is informative enough to pass for a textbook on insects, but it’s a lot more fun. Lift-the-flap features, pop-ups of insects on each page, and scrapbook-style design hold a reader’s interest. The last section of the book covers superlatives, such as deadliest, heaviest, fastest and strongest insects. The Cardboard Box Book, by Sarah Powell and Barbi Sido, is not a pop-up, but it is still a book that might be better bought than borrowed. This book features cardboard-box projects for younger children, but the instructions are better suited to older kids or adults. An array of creations—17 in all—invites readers to make a market stand, play oven, gingerbread house, and even a plane and car that kids can fit inside. (The crafts are designed and made by Bethany Side.) A puppet theater, playhouse and fairy wings are all included and are much more charming than plastic, store-bought varieties. A list of items useful in creating the projects is included at the book’s beginning, and instructions are well-illustrated and clearly written. This would make a great gift for a family, or even for the parents of children ages 3 to 8. For slightly older readers, writers and artists, many books encourage creativity with plenty of blank space. The popular series Diary of a Wimpy Kid by Jeff Kinney has the Wimpy Kid Do-it Yourself Book for writers to pen their own funny, embarrassing and real-life stories and artwork. Prompts are provided to get the writer started, along with plenty of the humorous comics Kinney is known for. Other books that invite creativity include 642 Things to Draw and 642 Things to Write About by Chronicle Books. These books feature very limited text prompts, with pages each divided into two or more sections. Part of the fun is that the prompts have nothing to do with one another, with such wording as “a motel” and “a string of DNA” sharing a page in the drawing book. The writing book is similarly quirky, inviting budding authors to write “an ode to an onion,” among other things. 642 Things to Write About is best-suited to teens and adults, while the young writer’s edition is best for tweens and under. Also included in this series is 712 More Things to Write About. If you know of a child who is unable to heed the old IBM warning, first issued during computer punch-card days, not to “fold, spindle, or mutilate,” then Wreck This Journal by Keri Smith may be the perfect gift. This book borders on disturbing, at least to a librarian, but its appeal to a certain kind of kid is unmistakable. Each page has prompts, many of which would be considered ill-advised in other settings: “Document your dinner. Rub, smear, splatter your food. Use this page as a napkin,” is one such prompt. Another is “Poke holes in this page using a pencil.” “Rub here with dirt” is my personal favorite. Any mischievous kid will appreciate this book. In the spirit of the season, this list would not be complete without Cookie Count: A Tasty Pop-Up by Robert Sabuda. Beginning with one chocolate chip cookie, and including such delights as fortune cookies complete with fortunes, stained-glass cookies and beautiful Linzer hearts, this book wraps up with “10 gingerbread windows for hiding,” set in a pop-up gingerbread house with gorgeous detail both inside and out. Accompanied by a nice box of cookies, this would make a delightful gift for a child, a parent or (hint, hint) maybe even your favorite librarian.